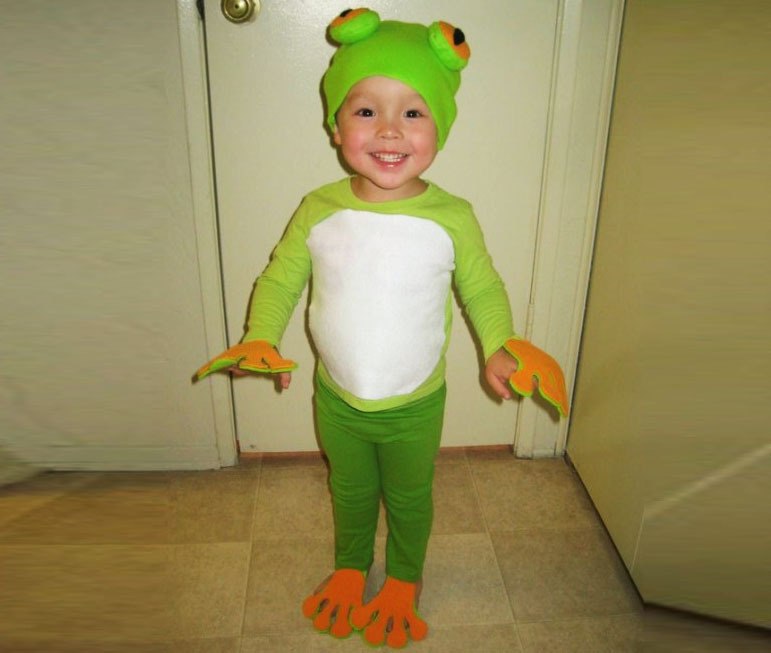 The winner of last year's Inhabitots Green Halloween Costume Contest was this adorable frog costume made from Goodwill finds and fabric scraps. Mom Mika was kind enough to share her trade secrets, so you too, can transform your cutie into a little green frog this Halloween. Read on to see how to make this costume yourself. Start with a green tee. Mika found an appropriately colored girl’s long sleeved t-shirt at Goodwill. It had a design on the front, but she covered it with a white patch. 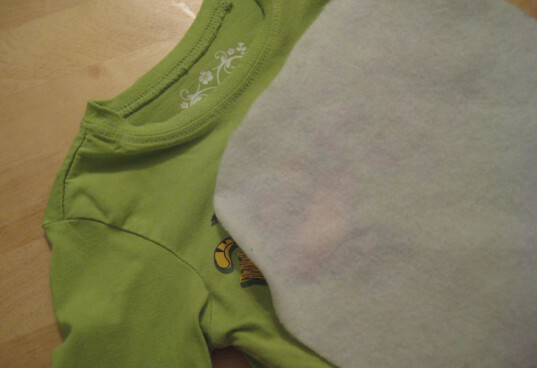 The white patch on the frog’s belly is a big piece of fleece that Mika had leftover in her home fabric stash. If you have fabric scraps at home, look there for supplies before you buy new ones. 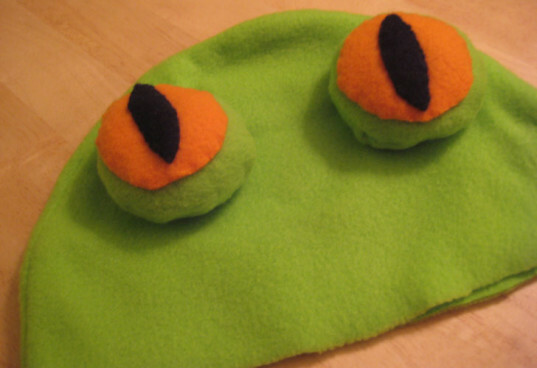 Mika made a simple hat with attached eyes for her son using fleece she bought, but again you could use scraps if you have them. Next, she cut hands and feet out of the same fleece fabric. She also sewed some small elastic loop on the feet to ensure they would stay on top of his shoes. The pants were the hardest part for Mika. She found a plain large T-shirt that was the green color she wanted at Goodwill. She then cut that shirt and sewed them into leggings using a pair of her son’s pants as a guide for size and fit. 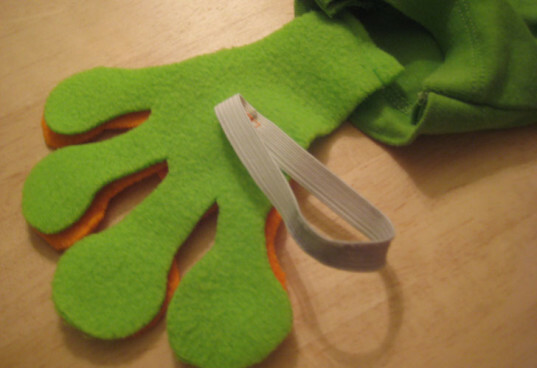 And there you have it — an adorable DIY frog costume! Start with a green tee. Mika found an appropriately colored girl's long sleeved t-shirt at Goodwill. It had a design on the front, but she covered it with a white patch. The white patch on the frog's belly is a big piece of fleece that Mika had leftover in her home fabric stash. If you have fabric scraps at home, look there for supplies before you buy new ones. The pants were the hardest part for Mika. She found a plain large T-shirt that was the green color she wanted at Goodwill. She then cut that shirt and sewed them into leggings using a pair of her son's pants as a guide for size and fit. 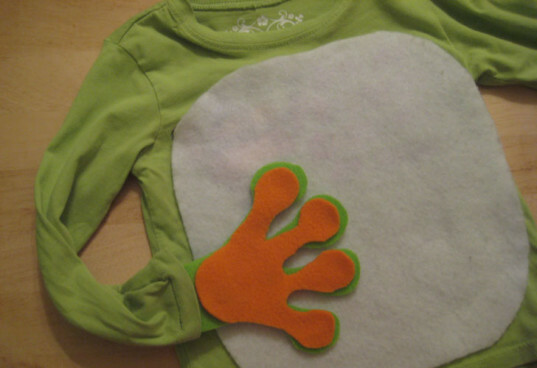 And there you have it -- an adorable DIY frog costume!